It was a beautiful sunny day for an outdoor lunch date with S at The Henry Hotel Manila. I have a confession to make. I was disappointed at first for saying YES because like most people, I am afraid of being in the sun. It is said to cause skin cancer, premature aging and skin darkening. But as the day progressed, I am actually glad that I said YES! because S is actually Silka. 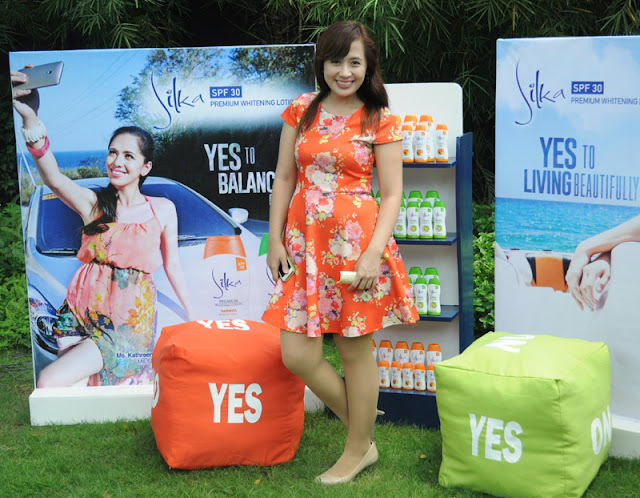 Silka has launched a new campaign dubbed "YES Skin with SILKA" which means that with Silka lotion with SPF 30, your skin can say YES to anything. It whitens, nourishes and protects your skin from sun damage anytime you're outdoor and even on a cloudy day. With Silka Premium Lotion with SPF 30, we can now say YES to challenges, YES to balanced skin, YES to confidence under the sun, and YES to living beautifully. We can now achieve healthy, white and protected skin with Silka Premium Lotion with SPF 30. It is the best choice for everyday outdoor essentials because it provides everything your skin needs- WHITENS, NOURISHES, and PROTECTS. It comes in 2 variants in affordable price versus competitors. Never say never and always say YES to anything under the sun with Silka Premium Lotion with SPF 30! For more information, Like Silka Skincare on Facebook. Reasonable price kaya mapapaYES ka Silka. Hi! Do you know if Silka is a cruelty-free product? I want to try using the lotion bec it's cheap and it has high spf but I'm not sure if the product wasn't tested on animals. Maybelline White SuperFresh Kit Giveaway! Elijah Joaquinn's 7th Birthday Party Giveaway!